You've been in a haunted house decorating war with your neighbors for weeks. You put up creepy tombstones in the grass, they put up tombstones, too. You hung ghosts from the trees, and then so did they. You cobwebbed every external inch you could find, and...well...you get the picture. It looks like you're going to have to find a unique decor item that will put you over the edge and help you win the title of coolest Halloween abode! This Pop-Open Purple & Orange Lantern Set will add spooky-chic flair to your porch, entryway, or steps. They're the best kind of decorative magic—easy to use and hard to beat! This powerful duo is crafted of paper and hang easily from trees, eaves, and ceilings. Seriously, they give so much atmosphere! 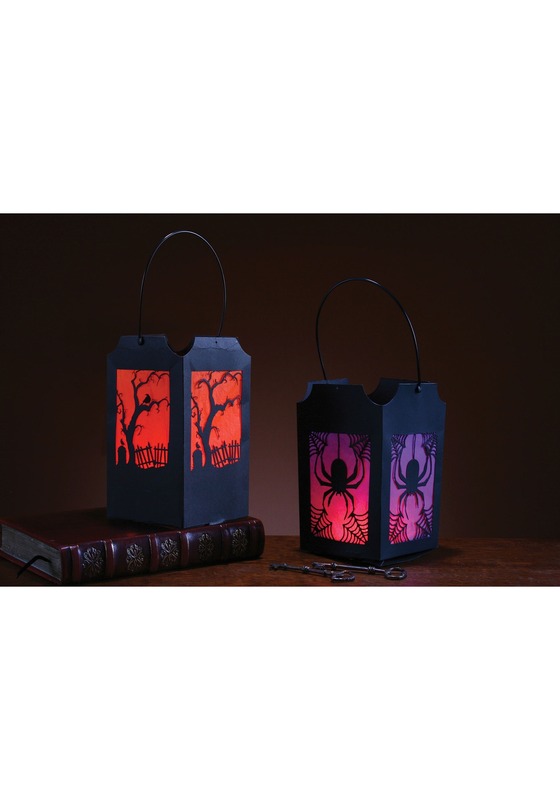 Black stencil cut-outs boast both a crooked tree and a spider pattern, and they silhouette dramatically against the vibrant orange and purple backlighting of the lanterns. The best part is, they use simple tea lights, so no need to worry about open flames. Fancy, festive, and easy to operate—you neighbors will surely covet them! Never underestimate your ability to outshine the competition. Once your neighborhood sees these spooky lanterns, they'll know just who's got the most haunted house! And it's all in the name of good, spooky fun, of course.